Senior Year Brings the Oft-dreaded Question “What Are You Doing Next Year?” Many Shape Their Answers with Help from the College Career Services Office. In the process of making a quilt for the Career Services Office wall, Administrative Assistant Lisa Maginnis realized that it had more significance for its location than she’d thought. A LARGE MAP OF THE WORLD HANGS ON THE WALL OUTSIDE THE CAREER SERVICES OFFICE AT THE WEST END OF PARRISH HALL. Clusters of small paper flags—densest over the United States—are pinned on the map, showing the whereabouts and current activities of recent Swarthmore graduates. A printout beneath the map advertises a Google site where students can register their locations as well. Inside the cheerful and inviting office suite, the first object that catches the eye is a brilliantly colored wall quilt made entirely of neckties. “A quilt is warm and welcoming, the way I wish our office to feel to all who visit,” Maginnis says. 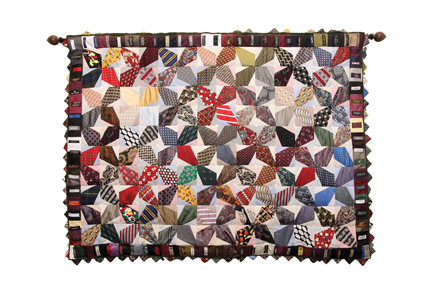 “When I spotted the pattern in a magazine, I was drawn to the obvious connection to business attire, but thinking about the process for creating the quilt, I realized that the similarities went deeper than just the neckties. 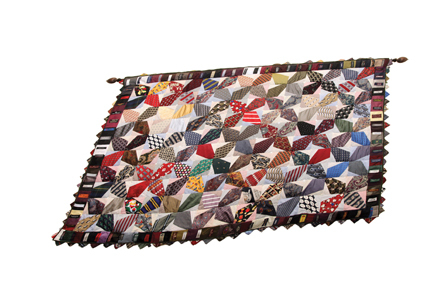 In the quilt, the ties are cut down to emphasize their details. The individual prints are sorted, using their similarities and differences to come up with a unique and colorful pattern. They’re assembled neatly and quilted for warmth and comfort. To present the project, I needed an impressive border. The result is a unique piece of art. Rooms on each side of Maginnis’s desk contain computers where students access information on career development, jobs, alumni mentor contacts, internships, and more. Bookshelves house publications on topics such as choosing a career, writing grant proposals, and crafting a resume and cover-letter. Leaflets advertising dozens of upcoming CS-sponsored activities hang in plastic wall pockets. Plates of cookies or candy lie around on large meeting tables. An enticing aroma of coffee wafts through the suite. Students wander in and out. CS staff members—Director Nancy Burkett; Associate Director Erin Massey; three assistant directors, Marissa Deitch, Jennifer Barrington, and Kristie Beucler; Maginnis, and 13 part-time student workers—strive to create an environment where students can feel comfortable about sharing their career dreams, aspirations, and fears and open to receiving help in achieving their goals. While at Swarthmore, Katherine Aizpuru made frequent use of the Career Services resources, obtaining help with her resume, the art of the interview, and summer internships. Now teaching English in China, she’ll head to Harvard in September 2011. KATHERINE AIZPURU ’10 GOT AN EARLY START on her planning, using CS almost exactly as Burkett recommends—although far from every student follows Aizpuru’s lead. During her first semester at Swarthmore, she was already thinking about an internship for the following summer. During a visit to the Career Services Office, she learned from a career peer adviser (CPA) how to search for internships using the office’s online e-Recruiting database. She also received a packet of sample resumes and cover letters. She modified the resume she’d used for her Swarthmore application, identified some internship possibilities, drafted a cover letter, and returned to CS with the letter and resume for further tips on improving both documents. Submitting several resumes and cover letters, she received invitations from two organizations for telephone interviews. “Nancy taught me how to carry out a successful telephone interview, recommending that I smile during the call, because people can hear when you smile; keep my resume in front of me; make lists in advance of strengths and weaknesses; things like that,” she says. Both organizations offered Aizpuru an internship. She chose the Congressional Management Foundation, a small Washington, D.C.–based nonprofit that works with Congressional offices to improve management practices and increase efficiency. As a sophomore, Aizpuru returned to CS to update her resume, planning for the next summer. This time, the native of Edina, Minn., wrote directly to her own U.S. senator’s office in Minneapolis and was offered an internship there. The fall of her junior year found her in China, interning at the Shanghai Academy of Social Sciences. Back at Swarthmore in spring, she worked with CS on her growing resume,and attended a job and internship fair in Washington. “I did a mock interview with Nancy to prepare for several phone interviews during the application process. I was applying to some organizations that were very different from those with which I’d worked before, so it was helpful to talk about how to tailor my discussion of past experience to new types of organizations. CS was very helpful during what ended up being a tough semester of internship applications.” Applying to more than 20 organizations, Aizpuru ended up interning at the National Security Network (NSN), an advocacy and communications organization in DC. That same summer, starting on law school applications, Aizpuru says: “Nancy helped me flesh out my ideas for my “supplemental”—also known as “diversity”—essays and offered helpful feedback on my essay drafts. Following graduation in June, Aizpuru took a July-to-October internship as a student ambassador in the U.S. Pavilion at Expo 2010 in Shanghai. She plans to stay in China to teach English and travel until June 2011. Burkett also helped her brush up her “teaching resume” to send to schools and employers in China. She’ll head to Harvard Law School next fall. AT THE BEGINNING OF EACH ACADEMIC YEAR, the CS staff holds an open house, to which members of the campus community—but particularly first-year students—are invited. In an informal atmosphere, students drop in, ask questions, pick up information, make initial contacts and even appointments with staff members, and enjoy an assortment of snack foods. “Our aim is to encourage students to begin the thought process about their interests, skills, passions, commitments and personalities, about what makes them who they are, and help them to connect those attributes to possible future paths and careers. We encourage them to do this as early as possible, so that they can have multiple opportunities to try things out before they graduate,” Burkett says. She mentions internships but also strongly emphasizes the usefulness, starting in students’ first year of college, of externships—“mini-internships, which provide one-week job-shadowing opportunities, mostly during winter break although also possible at other arranged times.” By spending a week with alumni, parents, or friends of the College who have volunteered as hosts in their workplaces (and often also in their homes), the externs obtain glimpses into various careers, build an experience base as well as an important link to their alumni hosts, and either decide to pursue a prospective career or reject it and move on. Externs spend time in research labs, museums, art galleries, hospitals, offices, theaters, environmental sustainability groups, and countless other workplaces. Externships take place in Philadelphia; Boston; New York; Washington, D.C.; and San Francisco. National Extern Coordinator Josh Green ’92 serves as a liaison between the Career Services Office and local coordinators in each of the five cities. As sophomores, Burkett says, students begin to focus on choosing majors and often visit the office to figure out how certain majors relate to various careers. In their junior year, students receive strong encouragement to do internships if they haven’t already, because of their value not only in providing experience in a certain field but also because recruiters and employers place great value on internships when evaluating a potential new hire. “Ideally, there should be a direct correlation between an internship and the job a student is applying for, but even without that correlation, employers value the fact that the applicant has gathered experience and training in a working environment, which many don’t have before an internship,” Burkett says. Seniors typically engage with CS early in their final year to discuss jobs, networking strategies, and recruiting opportunities. “We bring employers to campus, many of whom are alumni, and we also use off-campus recruiting to help students who are focusing on a job search,” says Burkett. For seniors intending to apply to graduate school, Burkett says that since most applicants have already decided on their fields of graduate study and are receiving help from faculty advisers, the task of CS is to help them compile personal statements and—should a student wish to wait a year or two before entering a graduate program—to offer advice on finding meaningful occupations for the interim. To ease the transition into the world beyond campus, CS staff members reach out to students in a variety of interesting and innovative ways beside internships, externships, and practical help with job and graduate school applications. Every afternoon, career peer advisers hold drop-in sessions at which they answer students’ questions and guide them in the use of the office’s various resources. Although Swarthmore’s academic curriculum does not include business studies, students can obtain an introduction to the business world by participating in a CS program called Educating Socially Responsible Leaders, which informs them about business careers and also incorporates the noncredit course Business Fundamentals for Liberal Arts Students. 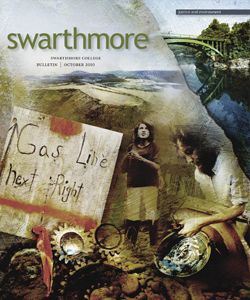 Then, there’s the Swarthmore networking. Every fall, in collaboration with the Alumni Council, Career Services holds an Alumni Student Networking Dinner. Barrington and Beucler work hard throughout the year to coordinate further on-campus dinners, receptions, and alumni panels to introduce students to alumni. Last January, during winter break, a Wall Street networking reception brought 69 alumni to the Penn Club in New York City to talk with students. A series of public service career events including lectures, panels, workshops, seminars, dinners, and other events acquaints students with jobs in the federal government, public service fellowships, careers in the foreign service, nonprofits, and the Peace Corps. On-campus mock interviews with alumni and other volunteers from various professions help to prepare students with interest in their fields for the real interviews with company recruiters, who visit the campus to meet with undergraduates. And finally there’s the presentation. An annual Dapper Dining event teaches students the art of professional dining in a sophisticated setting. An invited speaker offers tips on dinner conversation and etiquette—the correct use and holding posture of flatware items, and other skills needed to make a good impression on a prospective employer—as they enjoy a three-course meal. The CS even provides a closet full of business attire for students who wish to dress up for interviews but don’t have the proper suit of clothes. “Once you graduate, you’re under pressure to make an income. 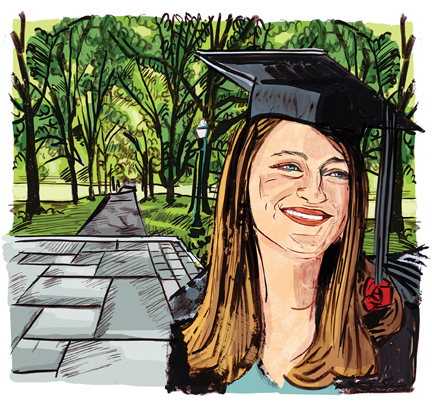 For the past 16 years, your purpose has been to obtain an education, and if you graduate without a sense of purpose, it can be really overwhelming,” she says. Career Services, Burkett adds, is an educational unit outside the classroom that helps students learn about another facet of life—that of the world beyond campus. This year, 77 percent of the senior class visited the office. She would like to see them all there. Johanna Goodman lives and works in Nyack, N.Y. She attended Boston University School for the Arts and Parsons School of Design in New York, where she earned a B.F.A. 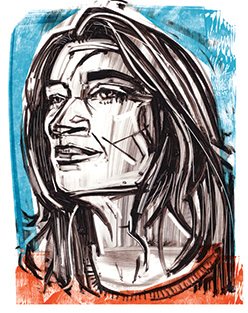 in illustration in 1992. She has since been painting and drawing for such clients as Rolling Stone, Time, MTV, The New York Times, Sports Illustrated, JazzTimes, The Wall Street Journal, The Progressive, A+M Records, the WNBA, and many others.